Woven by hand in the style of Thailand's Lahu people, geometric motifs appear in colorful cotton. Artisans from Thai Tribal Crafts create this beautiful set of six coasters. 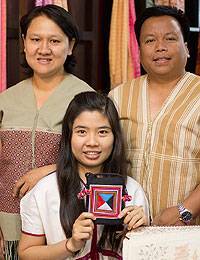 Lahu women often augment their family's income with textile crafts, including this type of patchwork appliqué. Please note: As this item is handmade, colors and motifs may vary slightly. The overall theme will remain the same.